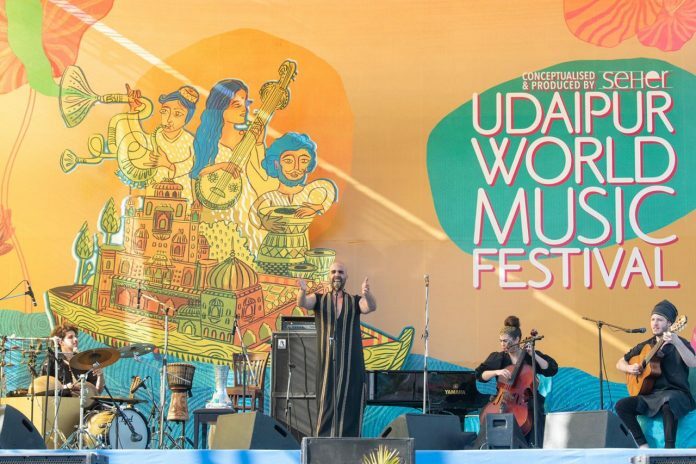 Udaipur: Udaipur World Music Festival, India’s biggest world music extravaganza, started with the spectacular Gulaza from Israel and Yemen singing secret women songs, setting the mood for upcoming days. The three-day festival features several genres of music featuring musicians from countries such as Italy, France, Cuba, Brazil, India, and many more. With a footfall of over 50,000 people every year, the festival is a beautiful integration of music cords from around the globe. Conceptualised and produced by Seher, the 4th edition of Udaipur World Music festival is presented by Hindustan Zinc, Wonder Cement and Rajasthan Tourism. The performances by Gulaza was followed by YVES THIELER TRIO (SWITZERLAND) who presented Swizz Jazz ft. and ALBALUNA ‘s (PORTUGAL) folk, rock, funk singing inspired by traditional Iberian repertoire. The festival is organized at three picturesque venues (Amber at Amet Haveli, Ambrai Ghat, Fateh Sagar Paal and Gandhi Ground). This year the most anticipated performances are those by artistes such as Vibha Saraf (India), Albaluna (Portugal), La Dame Blanche (Cuba – France), Natig Rhythm Group (Azerbaijan) among others who will play various genres of music and leave the crowd spell bound.